@Patty, I am so grateful for the complements. And most grateful to you for the strong spirit to walk, then run and that you are training for a half marathon right now, wow!!! You are simply awesome. It takes a determined and strong spirit to run and I tell you "you got both". You are a great team leader you encourage me to walk/jog now I am almost running. Never ever ever ever thought that I would be training for any more than sit ups. Wow! I feel so humbled right now. I really appreciate these comments and it has brought so much sunshine to my day. I feel so honoured and motivated to do more for this team and other teams. AEGISHOT, I want to thank you for your encouragement on this team. I've been a member of other teams where I feel like I am just floating. On this team, you really make a big effort to encourage us and celebrate our success. 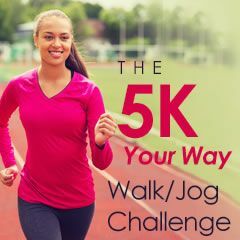 Now that I've completed this program and participated in my 5k, I think I owe you a big for your help along the way. I am sure you have many other responsibilities and I appreciate the work you put in on this team. How do you time yourself? How many active members on this team? How fast do you jog or run?